Can Silicon Valley’s Pro-Antitrust Congressman Navigate His Monopoly-Friendly District? It shouldn’t have been surprising when Ro Khanna, the newly elected representative of California’s 17th congressional district, said the Justice Department and Federal Trade Commission should review the potential impact on jobs and wages of Amazon’s purchase of Whole Foods. Khanna, 41, has emerged in his first congressional term as one of the loudest voices on antitrust and economic competition issues, and the proposed merger between Amazon and Whole Foods had attracted the attention of anti-monopoly activists worried about the combination of a major grocery chain and Amazon’s automation and delivery infrastructure. But it was surprising, mostly because of where Khanna’s district is located: Silicon Valley. While Amazon isn’t headquartered in Khanna’s state, its big-tech peers (and their employees) are housed in and around his district — and if there’s any industry you’d expect to be wary of antitrust talk, it’s tech. Google, Facebook, and Apple have all been accused of being monopolies. In many ways, the growing antitrust movement is antithetical to the business culture of the tech industry. Monopolies have been described as inevitable in Silicon Valley, or at least a common outcome, and even desirable. The Valley’s libertarian skepticism of government regulation, combined with its unrestrained idealism, has made it easier for tech people to believe monopolies are natural and good. So far, Khanna doesn’t seem particularly concerned that his comments will offend his constituents. On the antitrust issue that might be the most pressing to Silicon Valley in particular — the AT&T–Time Warner merger, opposition to which observers like investor Mark Cuban say could be turned on Facebook and Google — Khanna has been outspoken: “Every American should be concerned that a few major corporations control the flow of news and information,” he tweeted in November. “The AT&T–Time Warner deal must be rejected.” But he said that blocking it shouldn’t cause concern for tech companies. “You cannot compare telecom companies that control access to the internet with those that provide a platform [or] content,” the Democrat told Select All last month. Thanks in part to the unique nature of his district, Khanna has become a highly visible member of a growing cohort of activists, politicians, think-tankers, and fervent Twitter users that wants to return to a broader interpretation of antitrust law that takes into account impact on jobs, wages, and the ability of other businesses to compete. For decades, U.S. antitrust policy has centered on protecting consumer welfare — which in essence ends up translating to keeping prices down, to the exclusion of other impacts of corporate mergers and expansions. Reformers like Khanna believe that this approach has allowed corporations to grow unwieldy and control too many competing interests, to the overwhelming benefit of a thin strata of executives, exacerbating income inequality. This push to return antitrust policy to the more muscular presence it had in the first half of the 20th century now has a home in Congress: the Antitrust Caucus, which Khanna and fellow Democratic representatives Rick Nolan and Mark Pocan co-founded with support from Representative Keith Ellison, deputy chair of the DNC. As with any strength-building program, it will take some time to develop. The caucus’s first bill, announced last week, would require the Federal Trade Commission and Justice Department to conduct annual retrospective studies of the impact of mergers on jobs, wages, and local economies. 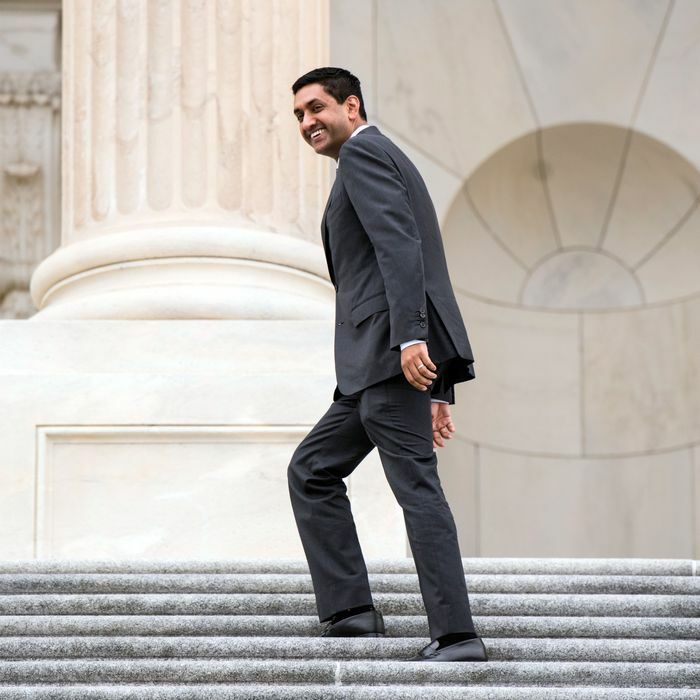 Khanna’s long-term hope for the caucus is to work on strengthening the FTC, which has the authority to investigate antitrust issues and take action, and the antitrust division of the Justice Department. He wants to lobby for more funding for the agencies, ramp up hiring, make them more independent from Congress and the White House, and give the agencies greater jurisdiction in industries like agriculture. So far, this tech-conscious vision of antitrust has worked well for Khanna, whose antitrust agitation hasn’t attracted much negative attention in his district. He might even find support — I’ve spoken to venture capitalists and entrepreneurs who worry about the power Google and Facebook have to quash competition from smaller companies. Of course, these investors and start-up executives are still resistant to government solutions. But even if regulation remains taboo in Silicon Valley, the idealism that has underpinned support for tech’s winner-take-all ethos has started to erode. Members of the tech industry are starting to question whether a small handful of companies should dominate the experience of so many internet users, especially in light of abuses like Russia’s dissemination of propaganda and disinformation on Facebook and other social-media platforms. A wave of sexual-harassment scandals has also tainted the industry’s image. Maybe most importantly, as far as most of Silicon Valley is concerned, any sort of meaningful antitrust enforcement against tech in the U.S. is a distant possibility. Compounding that awkwardness is the fact that the tech industry is also a major source of funding and power for the Democratic Party, not just Khanna, and that could pose a challenge for the party whose members birthed the Antitrust Caucus. In their Better Deal, which lays out plans to deal more aggressively with economic concentration, House Democratic Leader Nancy Pelosi, another Californian, and Senate Minority Leader Chuck Schumer of New York list the airline, telecom, beer, food, and eyeglass industries. Notice anything missing? Khanna insists that he can be tough on his district’s most important industry. He’s spoken against corporate tax reductions that would benefit companies in his area, saying that it won’t lead to job creation. Again ragging on Amazon, in September he criticized the company for seeking tax breaks from localities vying to host its second headquarters — though he has not called out Apple, headquartered in his district, for tax-dodging. Khanna’s views are nuanced, he said, and he’s open to hashing them out with colleagues in the Antitrust Caucus. At this point, it’s too early to tell whether he’s a sleeper agent for an economic movement that will eventually topple tech, or a beachhead for a broader and less aggressive mainstream approach that will try to steer reform around the perimeter of Silicon Valley as deftly as it can manage. Ultimately, this particular tension — between populist economics and the interests of top donors and businesses — might be one of the most conventionally Democratic things about him.